David Lynch and Mark Frost’s 18 part series for Showtime, Twin Peaks: The Return, has drawn a lot of attention from critics and scholars since its release in 2017 and, following an enthusiastic recounting of Episode 8 from my colleague and long time collaborator Rupert Loydell, we started developing a paper on the show. Our focus was on how sound and music is used in the series, particularly in the spectacular eighth episode. I delivered a paper at the CILECT North America Sound and Storytelling Conference in March 2018 (read it here), and Rupert and I delivered a second paper at the Music and Moving Image conference in New York in May 2018 (read that here). 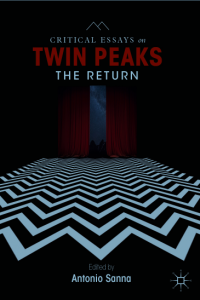 We’ve since delivered a book chapter for Critical Essays on Twin Peaks: The Return, edited by Antonio Sanna for Palgrave MacMillan in 2018 and, following the MAMI conference, are working on a second book centred around rhizomic storytelling and sound in the series. Rupert and I have worked together on two journal articles and a book chapter since 2015, making use of the Oblique Strategies to write sections independently and then bringing these together for the final paper. The opening line in the first episode of Twin Peaks: The Return, spoken by Carel Struycken’s character, asks FBI Special Agent Dale Cooper to ‘Listen to the sounds’. 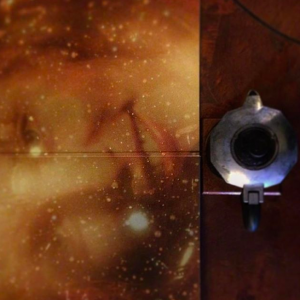 Throughout the series, writer, director and sound designer David Lynch deploys a complex combination of sound and visuals in order to depict mysticism, the impossible and bring to life the birth and spread of evil in the Twin Peaks universes. Paying attention specifically to the predominantly dialogue-free episode eight of the series, we explore how Lynch makes use of intricate sound design, score, existing source music and music performed within the diegesis in order to complete his intricate visuals. 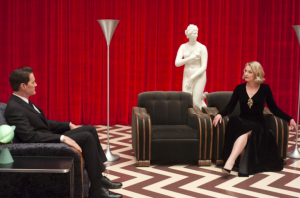 We explore how the episode, and series as a whole, makes intertextual connections to conventional and experimental film form in addition to extending upon established Lynchian worlds, and how manipulation of sounds within the series lends an otherworldly quality to the image. Marshall and Loydell, a musician/writer and writer/painter respectively, will use the words of David Lynch, composer Angelo Badalamenti and sound supervisors Dean Hurley and Ron Eng together with critiques of Lynch’s work, to better understand the complex, alienating world of Twin Peaks, and the significance of sound and music within the construction of place, space, character and narrative in the most recent series.